talk about the incredible, crazy faith they had to have had in order to do what they did. What I have come to realize, however, is that crazy faith, or having crazy faith, does not mean one does not feel fear or anxiety as he or she waits and works for God to “show up.” I have come to recognize something that I have dubbed “the Red Sea moment” that all bouts of crazy faith must have. This “Red Sea moment” is, of course, about Moses. The Bible is good about telling stories without getting into the “meat,” or the human factor …of being human as one waits for divine intervention. Moses has been told by God to lead the Israelites to The Promised Land. What should have been 11 days, two weeks at most, turned out to take 40 years. No doubt when they finally reached the Red Sea (or, more correctly, the Sea of Reeds), they were all ready to get on with their lives. That desire would have been shared by Moses, maybe even more so, since he had been leading the people for so long! 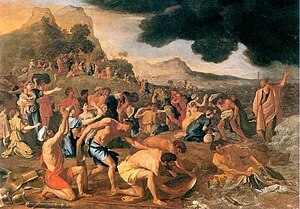 Moses had been roped into the job of leading the Israelites through the wilderness by God, and he had relied on the voice and direction of God throughout the journey, albeit he acted in frustration and not faith when he hit a rock that God told him to merely speak to, a breach in faith that cost Moses getting into the Promised Land. So, maybe Moses thought about what his frustration and doubt had wrought for him as concerns that rock as he now stood on the bank of the Red Sea. Can’t you see him? Standing there. holding a rod over the vast body of water, because God told him the waters would part? There he stood, as the Israelites, murmured against him …and as the Egyptians got closer and closer. Moses and the others could hear the hoofs of the soldiers’ horses, and might have been able to feel the earth vibrate and tremble as “the enemy” made its way to the exact place where Moses and the Israelites stood. But stand there he did. With the rod in his hand, holding it out “over the water,” which would only have been over the edge of the sea, ebbing and flowing onto the land. How crazy is that? Moses most assuredly had doubts and fears….but he chose to believe that God would do what God had said He would do. And God …did. That’s a wonderful story …but the point is that before there was the parting of the Sea there was probably a trembling of Moses’ very soul. Where was God? And when was God coming? His disobedience and frustration, which led him to hit a rock that God had merely told him to speak to, convinced him that God was 1) present, even when we don’t know it, 2) unimpressed with disobedience based on doubt, and 3) eager to show His/Her children that He was in fact, God. The Red Sea moment had to have been terrifying for Moses. Our “Red Sea” moments are terrifying to us as well. When we stand on the bank of a “sea” or on the edge of a “precipice,” needing God and believing God will come to us because God sees where we are standing and knows the situation we are in. when we can hear the “hoofs of the horses” getting closer and closer to us, we are being allowed to feel what Moses most probably felt. The key is to “stand our ground” while we wait for God. That is hard and that is scary …but that is what God would require, if the Bible is to be believed. The edge of the Red Sea, waiting in faith for God to “part the water” in our lives so that we can get to another place, perhaps THE place God has put in place for us, is not a comfortable place to be. We may even look at it as a test to see if we have faith or just give lip service to the same. Crazy faith means having stilled voices but enlarged spirits that are making room for God to do a new thing. Moses, in spite of feeling terror for sure, and worry about what the Israelites were thinking about him and what they would say if the Egyptians got there before the waters parted. Hr might have been seen mouthing quiet prayers as he waited for God. Many people have waited, like Moses, swallowing their fear and trying, working, to regurgitate their faith. Such regurgitation of faith has its own rewards. So true!! So true!! Thank you so very much for the inspiring, uplifting, and encouraging words of wisdom!! They are right on time!! Biblical stories are such wonderful depictions of how just waiting on God will never prove to be the wrong decision. But, they are stories from long ago. I really don’t know if I would have that same faith that Moses had, standing at the Red Sea with a stick, but, I do think that people that can get to that place are in a place where the evil, the sadness, and the pain of this world can never knock them down for long. What a great place to be. It’s true. Having crazy faith like that allows you to say that you are down …but not out. Down but NOT out!